I’m really dating myself with this post, but here it goes. Today, I’m celebrating ten years of being a Gator grad. I’m also consoling myself. I mean, how can I be ten years out of college? Am I that old? I really feel like I just graduated college, but then again, it seems like a million years ago that I strolled through campus as a student, trying to avoid the Hare Krishnas and other religious representatives/preachers on the Plaza of the Americas – a task as futile as trying to avoid the hot Florida sun. But I have to be thankful. This sounds so cheesy, but being a Gator grad is one of the biggest achievements of my life. The academics at UF are top-notch, and they make sure you know it and make you work hard for that degree, which in the end makes you a stronger person, ready to take on the tough stuff life throws at you. I am always surprised when I mention the term ‘weed-out class’ and get blank stares from people, as if it’s a new concept to them. Do other schools not have these? Regardless, it’s not just the education that made my college experience so amazing and memorable. It’s the whole package. I mean, a top academic school and a top party school all in one? Talk about the best of both worlds. I could fill the entire Internet with memories of my days at the University of Florida – memories that have shaped who I am. I never thought I would carry my college years with me as close to my heart as I have. In the past decade (eeks!) since graduation, I’ve noticed that there’s something different about Gator grads that I just don’t see in other alumni. There’s a certain level of boastful pride that is part of a Gator’s DNA – I think it has something to do with our bold and boastful school colors (which I love dearly). It’s like the Orange and Blue seep into your blood and change you. Being a Gator stays with you the rest of your life. Everywhere I go in the world, I not only see fellow Gators, but actually get greeted by “Go Gators!” – and often a Gator chomp. Seriously, this has happened to me in every country I have visited, no matter how remote I am, and my husband has encountered the same thing in his business travels which have taken him even further abroad than I’ve been. Even here living in North Carolina, I can’t believe how many times I’ve been honked at while driving just to see someone hanging out their car window giving me the Gator Chomp. It was so nice to see so many Gators the day I moved up. It made this state that I had never stepped foot in seem a little more like home right away. I’m lucky to have a welcoming alumni group that prides itself on serving the community as much as being the social Gators we were born to be. It’s kind of cool to know that there’s this whole slew of people who get it, who know what it’s like to be a Gator, even though we’re so far from the sunshine state and Ben Hill Griffin Stadium. Perhaps my attachment to my college days is a bit much. Perhaps it’s normal. Perhaps I’m just nostalgic and my pregnancy hormones are raging. I don’t know. But chances are that if you’re a Gator, you get it. So today, I’ll be celebrating and consoling myself on a decade of being a UF grad. This week, my twitter and Facebook feed have been bombarded by graduation messages, and while I’m excited for the new crop of Gator grads to join the world, I’m also a little melancholy that I’m one more year removed from that time in my life when I learned so much, not just about books, communication law (which has got to be massively different by now) and PR strategy, but about myself and who I want to be and who I became thanks to my years at the University of Florida. 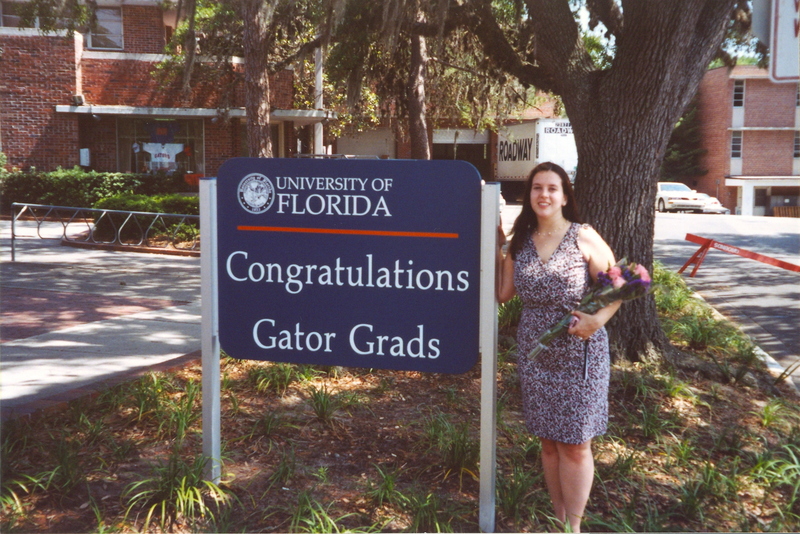 This entry was posted in celebrations, Lil bit about me and tagged gators, graduation, university of florida on May 4, 2012 by aliciamariel.